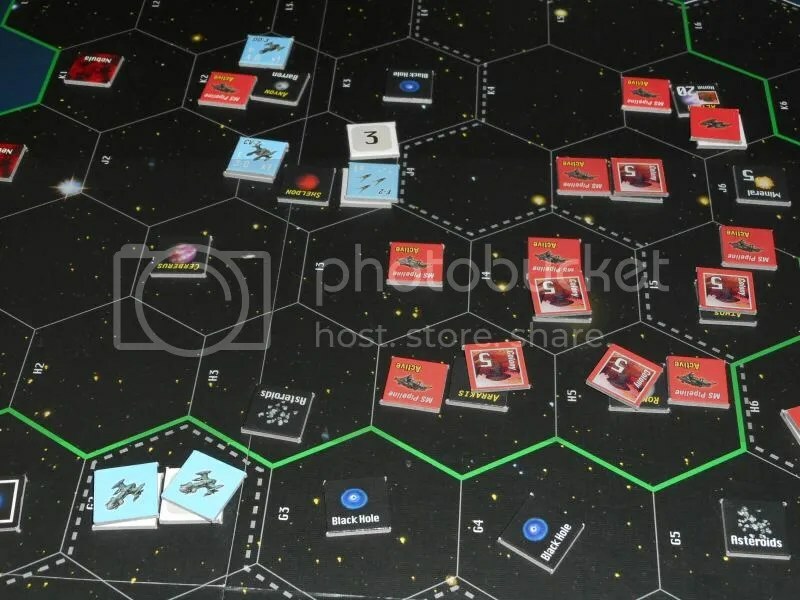 GMT Games and designer Jim Krohn have put together what is quite simply the best space game on the market. Okay, not everyone has come around to seeing it that way yet, but really… the game’s critics have to agree that all four “exes” are in evidence here and none of them get the short end of the stick. There are dangerous deep space hexes to explore. You can set up the perfect pocket empire as you expand across known space. The are barren alien worlds to exploit. And once you’ve gone shopping for your favorite technologies and constructed a massive starfleet, you can head off across the board to go exterminate your opponents. It’s fun. You get all the glory of a truly monstrous space wargame, but this one can be played in hours instead of days. And unlike its chief competitor, it’s set up to reward aggressive play instead of turtling. After a seemingly interminable glut of “group solitaire” type games that go out of their way to eliminate direct conflict, this one is a welcome change of pace. It may look a bit daunting at first. When I teach the game at conventions and so forth, I do sometimes encounter people that ask why it is that the game requires you to track technological advancements on a counter-by-counter basis. Wouldn’t it be easier to just let everyone upgrade all of their ships automatically whenever they buy upgrades? I personally think that it’s this sort of thing really makes the game worth playing. It’s just neat to have your oldest “clunker” ships fighting alongside the latest models. And when your ships are spending time travelling and invading, your opponents’ ships are slowly improving and adapting while your units are far from friendly ship yards. The fog of war is such that you can never quite tell if you’re going to just burn through your opponents’ colonies or if you’re going to get repulsed. That kind of tension is gaming gold if you ask me, and well worth a little minor bookkeeping. Another thing I hear occasionally is that maybe the opening part of the game could be cut short so that everyone can proceed straight to the action. I can sort of see where that is coming from. I mean, everyone has the same basic counter mix in their home systems, so there’s not too many surprises there. But in those first six turns, you’re setting up your economy without knowing what’s on the very borders of your core systems. You have to decide if you’re going to buy an extra mining ship or not before you know the nature of the deep space hexes. You’ll probably start building on a merchant shipping network before you know for sure that your geography suits that strategy. And you might make the decision to invest in terraforming technology before you even know the actual density of alien worlds on the map! None of these individual decisions can make or break your chances of winning. But they do matter and they can add up. And hey… this is the part of the game where you get to explore and exploit! It’s fun. And you don’t know if your opponents are going to send a few scouts over to harass you in the early stages. Do you build some defenses to cover for that or do you take your chances? If you play it too safe, you’ll be paying maintenance costs on ships that aren’t really doing anything while your opponents are putting their money in better tech and more economic power! That opening phase ends all too soon, though. All of a sudden, you have two enemy fleets on station at distant outposts, separated by only the flimsiest of frontiers. If you haven’t made contact yet, you’ll have no idea who is in the superior position. Different combinations of ships can exhibit wildly different levels of effectiveness depending on what they go up against. Raiders can slip through enemy lines and wreak havoc unless they are countered by scanner equipped destroyers. Fighters can be cause an amount of damage that far outstrips their size and cost. But scouts enhanced with point defense technology can pick them off with ease. And a minefield can take the blunt your fighting power if you don’t bring along any minesweepers. It’s worth it to sacrifice a few ships to find out what your enemy is up to, otherwise your first big battle can devolve into sort of a high stakes variant of rock-paper-scissors! Part of the reason that it’s so hard to tell what you’re up against is that you don’t even know how many ships are associated with a single counter. Numeric markers are stacked underneath them, so until there is a battle you don’t know if it is six scouts or a single battle cruiser. The larger ships can take multiple hits and have higher chances of destroying enemy units. But if a fleet outnumbers its opponent by more than two to one, it gains a bonus on all of its to-hit rolls. This means it’s not a smart strategy to send out large ships without any escorts. Similar to the combat systems from block war games, each ship group executes its turn in letter order. (If groups have the same letter rating, the group with the higher tactics technology goes first. Otherwise the defender goes first.) In the situation pictured above, the three fighters with a rating of B 5-0 attack first. They might roll three ten sided dice to target the large stack of enemy destroyers, killing one for each roll of five or less. Assuming that both sides have no tactics technology, the blue shipyard units (C 3-0) will fire next, followed by the red cruisers (C 4-1). The first number is the unit’s attack strength and represents the chance to-hit. The second number represents the unit’s defense strength and is subtracted from all attacks directed at the units. In this case, the shipyards have to roll a one or a two in order score a hit on the cruisers. But unlike the other units in the battle, it takes two hits to kill the larger and more formidable cruisers. In the situation here, things are not that favorable for the red player. One thing that can trip up people coming to this from other games like Axis & Allies is they might assume that they’ll be able to retreat at the end of a full round of battle. The way it works here, though, is that when a counter comes up in the letter sequence, it has the option to either fire or retreat right then. So even if red wants to pull out here, the cruisers will not be able to leave until after the fighters and the shipyards have fired. If he doesn’t have anything invested in tactics technology, the destroyers will not be able to leave until all of the blue units have had a chance to fire! 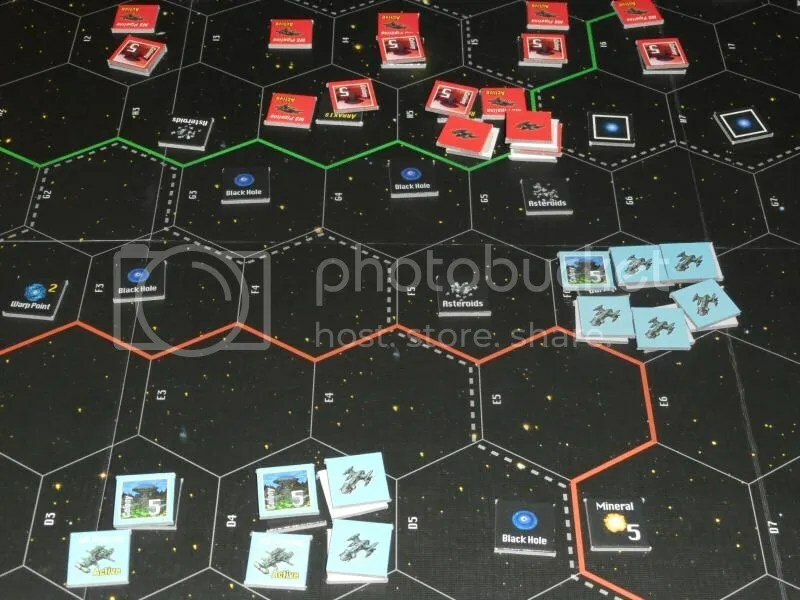 The details of the battle system may seem “fiddly” to dedicated board-gamers, but it doesn’t take that many fleet engagements of this size to settle a war. In the game pictured above, blue repulsed an initial attack from red while sending carriers and destroyers around the central barrier of black holes to raze the colonies on red’s right flank. The jig is up: red is not in a position to deal a comparable amount of damage and is unable to bring enough point-defense enabled scouts into play to counter both the flanking attack and the concentration of units in the center. The overall feel is that of pin and overload tactics in chess, but with many more details and nuances that can have sudden ramifications at the worst moments. But not everyone gets this kind of experience with the game right out of the gate. If you play a standard core set multi-player scenario without the advanced rules, then you don’t have any of the fancy stuff like fighters, raiders, or mines. Without these disruptive elements, the game is far more liable to bog down and drag on too long. Compounding this, novice players are going to be sending out ineffective fleets. It takes a while to figure out that a lone dreadnought is not going to pose much of a threat to anyone. It may seem like a lot to take on in the first go, but I really recommend new players to try the “short game” victory conditions with all of the advanced rules even in their first games. It’s worth the investment and it’s surprising, but adding in the extra rules does not in fact increase the “weight” of the game. They make for a richer decision making environment without slowing things down! You see, the advanced units of the game do more than just provide a means of keeping the small scout and destroyer units relevant even after they get obsoleted by the larger and sturdier ships. While all of the advanced ship technologies can be countered, they can’t all be preempted. If you’re setting up an attack, you probably only have enough resources to pick one of these technologies to bet on. From there it’s a matter of trying to capitalize on it before your opponent can adapt. Instead of a ponderous game where everyone can pretty much read the board, it creates a volatile situation where it’s possible to rapidly “check mate” someone in just a few turns. That basic situation is the backbone of the plot to half a dozen Honor Harrington novels and it’s completely exhilarating to be able to pull it off. Just like Star Fleet Battles gives you the sense of being in the captain’s chair like no other game, this one turns you into Grand Moff Tarkin: “I’m taking an awful risk, Vader. This had better work.” This game produces a war that simply cannot be won by the average “accountant” type of player. Hanging back and playing “diplomacy” isn’t going to cut it, either. This game forces you to take risks. You never stop being on the horns of a dilemma. And you have to make all kinds of important decisions without anything like complete information. Once you get over the initial learning curve, Space Empires: 4x can pack in incredible amount of action into two to four hours of game play. Trading brick for wheat is fine. Coordinating with your buddies to prevent a worldwide epidemic is all well and good. And hey, even busting out a cascade of “village” cards to rake in the gold has its appeal. But a certain type of gamer won’t be satisfied until he has exploded countless starships and toppled vast empires of pure evil. This is the game for them. And it packs in everything you could want in a space game without killing the tempo or the playability. I really don’t think a game this good could have been produced back in the eighties or the nineties. And I used to think that a game like this couldn’t be developed in this decade. But it’s here… and it’s awesome. If you’re tired of discarding games after about five or six plays; if you’re looking for something with enough depth that you’re liable to still be playing it ten years from now; if you think you could have done a much better job than Emperor Palpatine, then you need to take a look at this. (And even if your buddies don’t take to it, there’s still enough value in the solitaire scenarios here that you’re sure get your money’s worth; nice work there GMT!) It’s truly a masterpiece of game design and I can’t give a higher recommendation. What equivalent game would you recommend that can be played on a computer? I don’t know of any. Starcraft and Sins of Solar Empire are fine for what they are, but they don’t (in my opinion) accomplish what this game does. I’m probably not the best person to ask, though, as I don’t play a lot of computer games. It has a VASSAL Module, so you can play it free online with someone else as long as you have the rules. I’d say Star General, but I’d hate recommending Star General to anyone… so much unfulfilled potential! Even GMT’s COIN series is getting “AI” now. If you’re playing a long game of A Fire in the Lake and the ARVN player has to step away for a while, you can have the “robot” player keep his seat warm until the guy can get back. It’s also handy when you can’t find a fourth player. The flow charts look a little crazy at first, but it’s really neat to have these options. I’ve been looking for something more engaging than Monopoly or Risk with my family. Definitely checking this game out. For the family, you may get more mileage out of stuff like Catan, Carcassonne, Incan Gold, Revolution!, and Tikal. If any have the gamer gene, then Ogre, Illuminati, and Commands & Colors: Ancients are also good with younger and/or more casual gamers. Masters of Orion II (NOT III) is the classic computer 4X game, if you can get it to run on modern operating systems. This review convinces me that this game ought to be a computer game, not tabletop. Though uncertainty about technology seems to substitute for locational fog of war. Very intriguing. How would you compare this to Eclipse, which has been my go-to 4X the last few years? This seems to be a much longer game, but that’s not necessarily a downside. Also, the expansion — Mandatory, OK, Unnecessary? If you don’t know which type of person you are… something smaller and quicker like maybe the $2.95 edition of Ogre that’s on the game store shelves right now might be a better choice. However the solitaire scenarios in the Space Empires base set and the cooperative scenarios in the first expansion mean that you can ease into the game and even sidestep the direct conflict aspects in a pinch! The guys at GMT really knew what they were doing when they insisted that the game include those options, which is another reason why I rate it so highly. Purchased this game and the expansion as a result of this review. Have played 3 games, the first two as Jeffro recommended and the third with the expansion rules (not included the advanced section). How can I describe how good this game is? Let’s try this. I have 3 teenage boys. I talked them into playing the first game, which lasted about 4 hours. They wouldn’t go to bed until getting me to agree to setting up game #2, which would start the next day. Jeffro talked about how this game rewards aggressiveness. That is true. I think this aspect of the game is what makes it such a rush. Everyone is building up their forces and expanding (which is risky in itself). Then someone makes a move. That “move” starts a snowball affect as one player moves to counter and another player moves to take advantage of that move. The next thing you know, there is combat. This is handled brilliantly! Is your fleet big enough? Do you have the right tech? Does the other guy have mines, fighters, cloaking or some other “angle” that you didn’t prepare for? All this is done so well, I can’t thank Jeffro enough for turning me to this game and GMT for publishing it. Really looking forward to the second expansion (already pre-ordered that too). If you’re reading this and enjoy war games, space games, etc. then get this game. Be cautioned however. This game is NOT for wimps. The way someone wins is by destroying someone else’s home world. That means you will lose ships, planets and more ships. You will either be ruthlessly devouring your opponent(s) or they will be devouring you. Watching my youngest son unexpectedly invade my oldest son’s area was fun to watch. What made it even better was when he revealed 2 titans in the fleet (none of us thought any of the others would invest in that tech yet) and catch my oldest totally unprepared. After losing several planets, my oldest was able to hold on because the turn sequence allowed him to research and build mines. My youngest walked right into the trap and lost his Titans, but the set back in production to my oldest gave me the breathing space to focus on son #2 and take his home world for the win. Wow, what a great game. The first two game were as fun, but with different opportunities and winners. After each game there wasn’t a lot of complaining, instead there was analysis of how they would adjust to make sure “that” didn’t happen again and how changes to strategy would be made. Here’s an example: After 2 games, my #3 son went and rode his bike for awhile. When he returned, he announced that he spent his time thinking of his plan to win the next game. That thinking is what lead to his ‘titan plan’. When a game accomplishes something like that, then you’ve found a gem. Did I say this was a great game? What a story! Thank you for posting that. Thank you for letting me know this game exists!!! Found you through the Castalia House blog link from Vox’s site; now have you book marked and am checking out your gaming blog. You’ve picked up another regular reader for sure. Regarding “Tao of Gaming’s” questions. 1. We play and enjoy Eclipse. 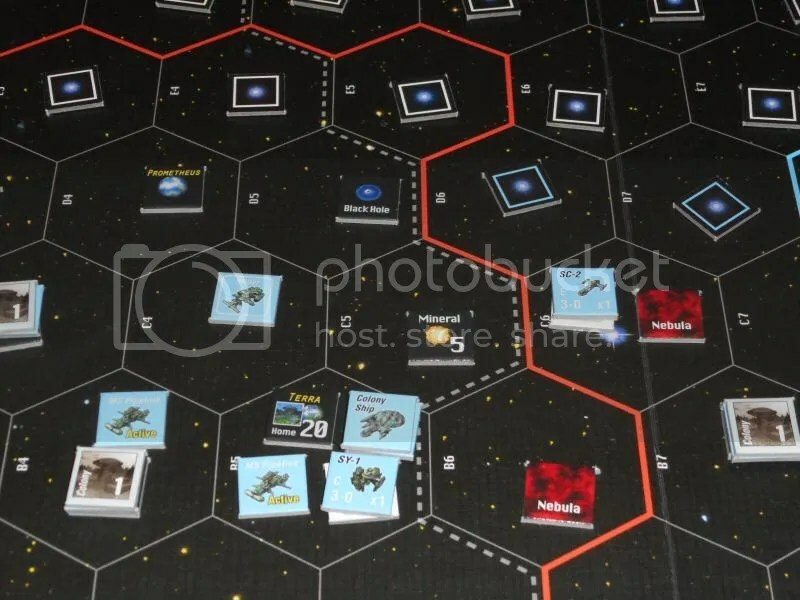 Besides having many more options than Eclipse, Space Empires has a great Fog of War mechanic. In Eclipse, you know exactly what you are going up against and therefore, battles often are “delayed” as build-ups occur or when someone feels confident they can win the battle. In Space Empires you have no idea what the other fleets contain, until the battle takes place. To see your opponents face when they realize you tricked them into sending their main fleet (which you didn’t know was their main fleet) to deal with a couple rogue destroyers (which they thought was your main fleet) is fantastic. Note: As Jeffro says, SE does not have nice big plastic ships, it has lot of counters. If you’ve never played a game with lots of counters, then follow his advice. If you’re a fan of games with depth (they usually have lots of counters) then dive in to SE. After playing Space Empires, I do not see us breaking out Eclipse except as an “intro game” to ease someone new into the genre. Space Empires will keep Eclipse and Twilight Imperium on the shelves except for certain situations where those games fill the niche. 2. About the expansion. Not mandatory, but highly recommended. 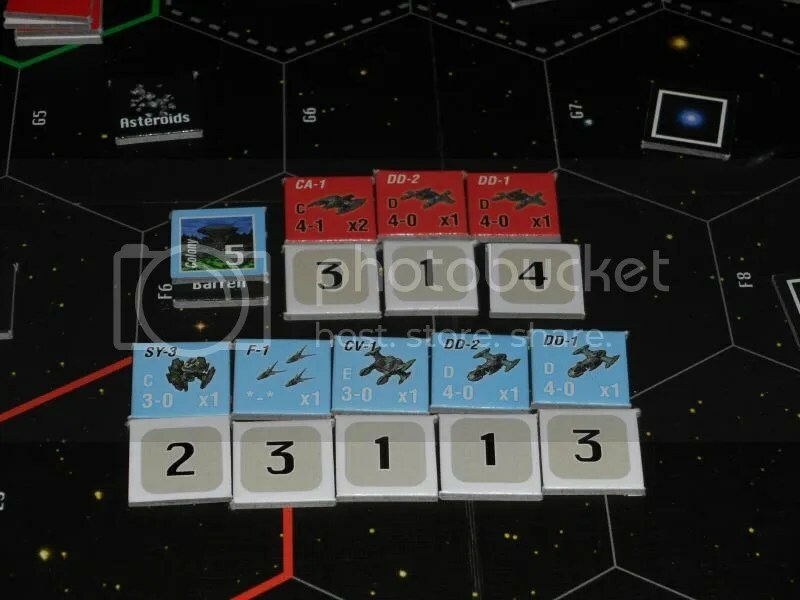 The added units, scenarios and rules increase the “war game feel” of Space Empires. My sons all commented on how the expansion made the game “feel complete”. Examples: player specific abilities, ship boarding, planetary forces, alien techs, titans, fleet experience, production and research variants, etc. All these add depth (and complexity) to the game, which may be too much for some, but for those that enjoy complexity…great stuff. So, the base game is GREAT. The expansion will add a slew of options that enhance every aspect of the game, but not mandatory by any means. Hopefully that helps.